The inner pages header background serves for differentiating the header of these inner pages from the header of the home page. To customize them, it is recommended that you have a sample page open, as the changes you make will not be visible otherwise. So, go to the Customizer -> Header Settings -> Inner Pages Header Background. Select the image – Here you have the section where you choose the image, from your computer. After uploading, you have the option to crop the image, in order to fit the inner pages background accordingly, or to skip cropping and leave the image as it is. Your theme works best with a header image size of 1920 × 800 pixels. If you don’t want the image to be displayed, after a while, you can choose the option to hide image. Position the image – Another option regarding your image is to position it the way you like (left top, left center, left bottom, centre top, center center, centre bottom, right top, right center, right bottom). You should have an eye for perfectly positioning your image, and One Page Express is busy with the rest. Randomize uploaded headers – you can enable this function and different header images will be displayed in different browsing sessions or to different users, at random. There’s a wide variety of colors for you to choose from, in order to set a gradient background. If the gradient you want does not match any of the suggested gradients in the panel, you have the option to search for it (in the upper part of the screen). In case you change your mind, and you want to replace the existing gradient with a new one, you might choose Change Gradient. And that’s it. Upload images – To create a slideshow, you have to upload at least 2 images. And the section provides you with dedicated places for uploading image 1, image 2, image 3, etc. – from Add new slideshow image. Slide Duration – slide duration refers to the time each image in the slideshow is present on your users’ screen. The value is specified in milliseconds. The smaller the value, the less time the image is displayed, before a new image comes on the screen. Effect Speed – the effect speed refers to how smooth is the transition from one image to another. The value is specified in milliseconds. The smaller the value, the more abrupt is the transition from one image to another. Self-hosted or external video – like for the Front Page header, you also have here the possibility to choose between a self-hosted video (MP4 format) or an external video. 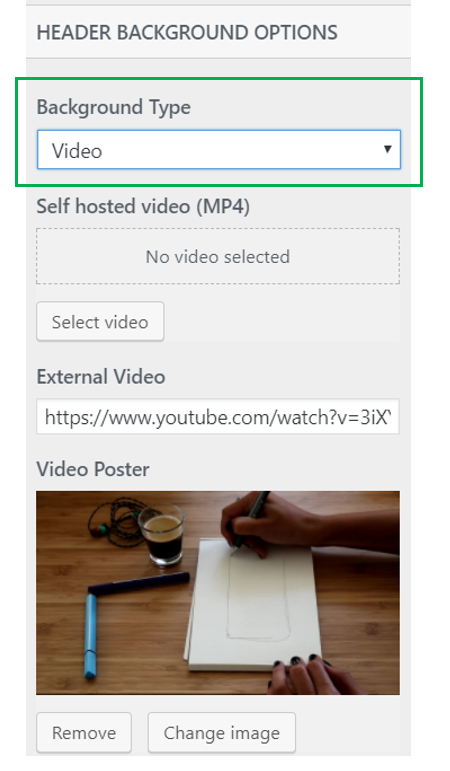 For an external video, all you have to do is specify the URL where the video can be found (YouTube, Vimeo, etc). Fill in the blank for External Video and that’s it. Video Poster – the video poster is an image. Precisely, the image that is displayed when the video is loading, or on mobile devices that do not support playing video backgrounds. Show overlay or uncheck the checkbox – The overlay is a semi-transparent colour that you apply to the header, for obtaining a nice visual effect. Either you do without a header overlay, or you want an overlay to be applied to the inner page header. In the first case, leave the checkbox unchecked. In the second case, select Show Overlay and let’s proceed to customizing it. 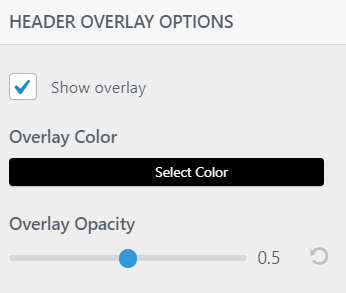 Overlay Color – There are plenty of options as to what color to select for the overlay. Pick the one that best suits your brand and proceed to the next step. Overlay Opacity – The overlay opacity refers to the transparency degree of the overlay. From 0 to 1, the colour of the overlay goes from the most transparent to the opaquest. Show header separator or uncheck the checkbox – The header separator is a graphic element that delimits the header from the rest of the page. Either you want a more stylish effect for the inner pages header, and you choose a header separator, or you leave the checkbox unchecked, and no border will separate the header from the rest of the page. Header Separator Type – The type of the separator refers to the shape of the graphic elements delimiting the header from the rest. Triangle, Tilt, Pyramids, Mountains, Waves, Clouds, Curve, Drops, Arrow, Zigzag are just part of the shapes you can choose from. Header Separator Height – the separator height refers to the vertical distance the separator occupies on the header background. 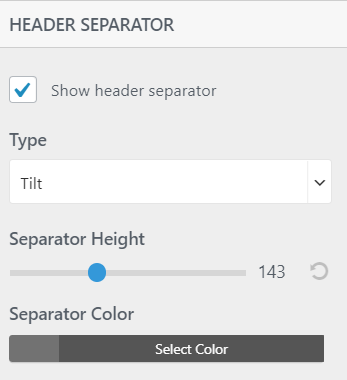 Header Separator Color – As the name shows it, this option allows to select a color for the header separator, from a wide range of colors, according to your branding preferences.